A quick attempt at making fajitas. A nice chunk of beef, liberally dry rubbed with Mexican seasoning, then seared to medium rare on a griddle. Add to that tomatoes, sauteed peppers and onions, plus a dollop of sour cream, all wrapped up in a freshly made flour tortilla. It’s still missing guacamole but hey, it was yummy. Good enough for a quick, unplanned meal. Chilis, hahaha! But it’s fairly easy to make, so I suggest trying to cook. Oh yum! 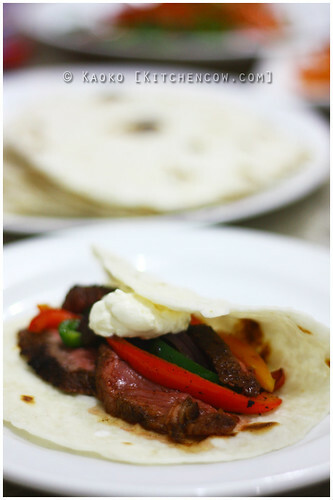 Which cut of beef do you use for fajitas? How long do you sear it? Do you use pre-mix Mexican dry rub or do you mix your own? What is the essence of being a woman? I used a hunk of top round, but i’m thinking a steak cut would be better. I wasn’t able to time it properly because I used an uneven cut of meat (my mistake, it cooked unevenly din tuloy), so I really suggest going with a steak cut. I used 80 Breakfast’s Mexican Seasoning mix, but I’d hazard that your regular taco mix would work? And the essence of being a woman?